Basketball was Davie Earl Boulton’s first love. Back at his St. Louis high school, he held the free-throw record for 58 baskets in a row. His stealth moves on the court also earned him a full-ride to college. So it seemed strangely ironic that, at age 57, Boulton would be diagnosed with a prostate tumor the size of a basketball. A year ago, as sick as could be and sidelined from his 30-year-career as a U.S. Postal Service deliveryman, Boulton was told by doctors that there was no hope. Nevertheless, as an Army veteran with a medal of honor, he couldn’t call it quits. Nor was his wife of one year, Sandy, about to let him go. Together, the Glendale couple came to The UA Cancer Center at Dignity Health St. Joseph’s Hospital and Medical Center for a second opinion. Boulton was seen by a multidisciplinary team led by genitourinary oncology specialist Jue Wang, MD, FACP. 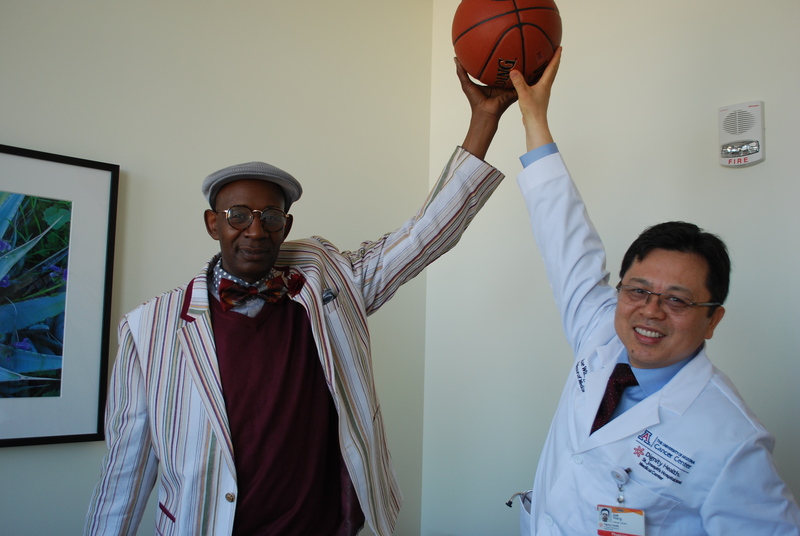 “We analyzed the DNA of his tumor and detected a weakness in his cancer, which was very aggressive,” says Dr. Wang. 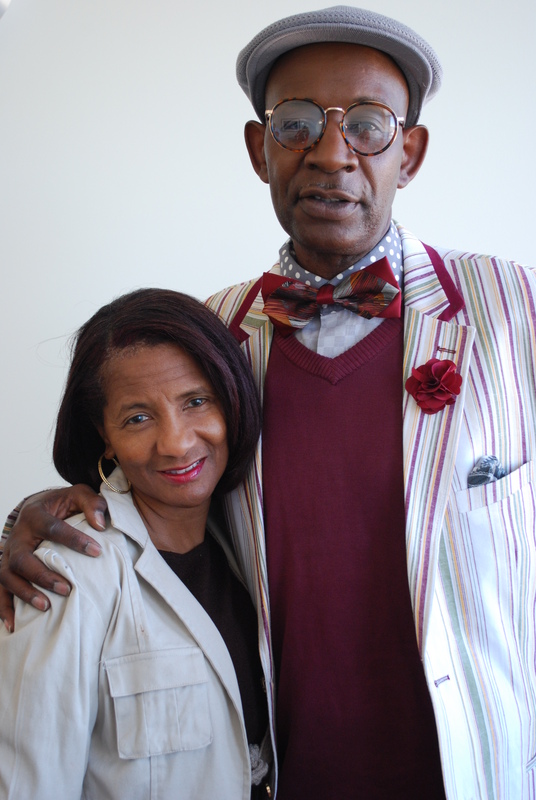 “But after a course of precision medicine treatment, his tumor disappeared, and his quality of life has been restored. “Dr. Wang was heaven-sent,” says Boulton. 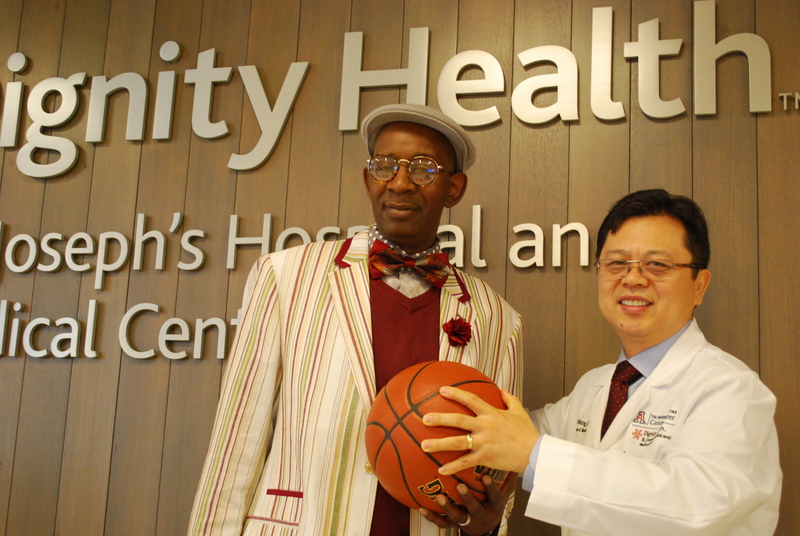 “I hadn’t touched a basketball in two years because of the pain. But I went to the gym yesterday and got 15 free-throws in a row." Impact the lives of more patients at St. Joseph's Cancer Center with your gift today! 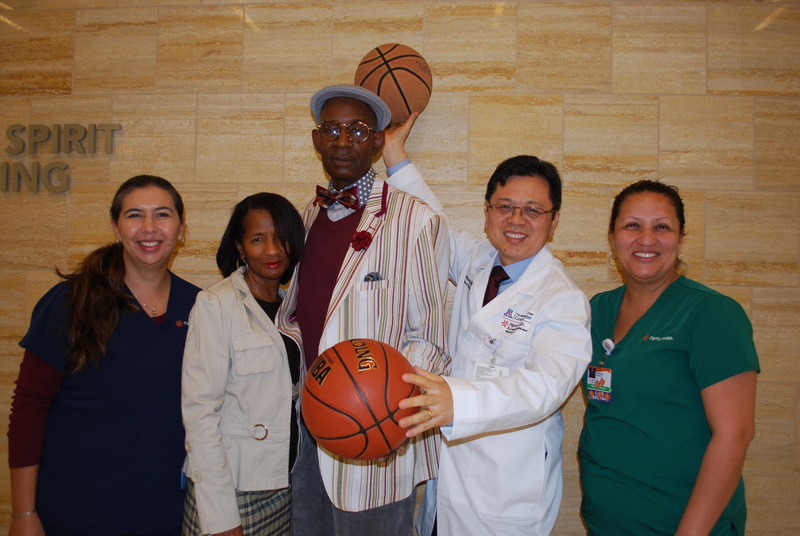 Davie Boulton and wife Sandy (center) celebrate a win against prostate cancer with his caregiving team at The UA Cancer Center at St. Joseph’s, including (left to right) Chanella Roy, RN, Jue Wang, MD, and medical assistant Adrianna Alvarez.